Teeth Bonding, also known as Cosmetic or Composite Bonding, is a process in which an enamel-like material is applied to a tooth’s surface, sculpted to an ideal shape, hardened and then polished for an ideal smile. This procedure usually can be done in a single visit. Bonding is more susceptible to staining or chipping than other forms of restoration such as porcelain veneers. Bonding repairs minor chips and small to moderate areas of decay in anterior and posterior teeth reinforcing the tooth. Bonding typically lasts for several years. Because it is a polymerized material it will wear with time necessitating its resurfacing or replacement from time to time. Crowns, or porcelain veneers are used in cases where patients are looking for a more long term predictable solution to their cosmetic problems because they are constructed from more durable materials and more aesthetic. One of the benefits of this procedure is that it requires minimal preparation of the tooth and can be performed in one dental visit. Additionally, the use of anesthesia is usually not necessary unless the bonding is being used to fill a decayed tooth. Dr. James Vito will match the shade of your teeth to select a composite resin color that will match the color your teeth. When compared to Porcelain Veneers, veneers require more tooth preparation, requiring at least two dental visits will be more aesthetic for longer but comes at an increased cost. 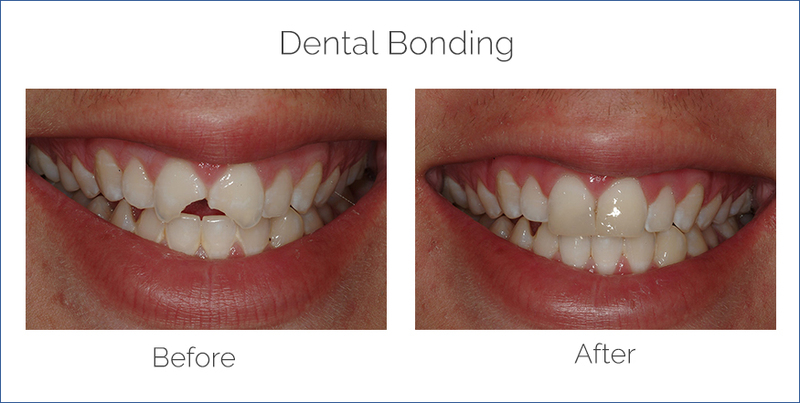 If you are interested in Dental Bonding for your teeth in the Philadelphia and Main Line area, call the office of Dr. James Vito today (610) 971-2590.